You deserve a stress-free renovation project that produces beautiful results—exactly what you’ll get from Aqua-Tech. When you entrust your bathroom renovation to Aqua-Tech, you can expect a superb experience from when you first visit us to discuss your requirements and budget to the moment we pack up to let you enjoy the beautiful final result. 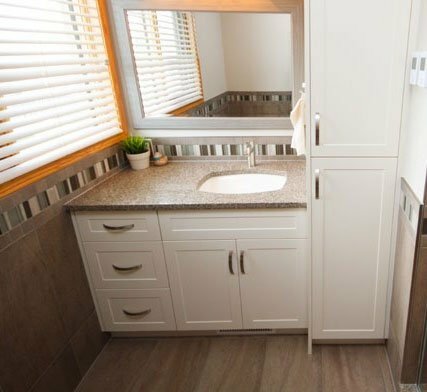 Aqua-Tech’s bathroom renovation process takes between three and six weeks on average to complete the installation, starting with our initial consultation to crafting the custom features you’ve requested and completing the remodel. The process begins when you request your personal tour of our showroom from one of our consultants, who will be happy to show you around and learn more about your remodelling requirements. 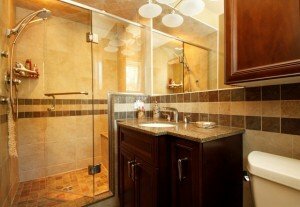 During that time we’ll establish your goals for your bathroom renovation, and we’ll create a lead sheet that includes products you like, your renovation ideas and—most importantly—your intended budget. Creating your budget can be one of the most difficult aspects of the renovation project, but it is without question the most important. Discussing your budget allows our bath design consultant and renovation team to work within it and ensure you’re completely satisfied with the final result. A huge contributing factor in us deciding to go with you was your conviction that once you start a job you stay until you’re finished. We’re very pleased! Next, we’ll have a consultation to discuss exactly what you’re looking for. You’ll meet with our consultant who can provide as much or as little support as you’d like. It’s during this meeting that you can explore how any custom cabinetry, glass or millwork will fit into your design, create moodboards or discover the products our exclusive suppliers offer. After our meeting, we’ll create a custom design to suit your tastes. Aqua-Tech’s Bath Manager will then visit your home to measure, take pictures, determine the cost of labour and inspect the existing plumbing and electrical structures. Once we have the measurements following the in-home consultation, we create a scaled drawing to illustrate how the final renovation will appear. Next, we’ll arrange an appointment to go through the labour estimate, drawings and finalize the product selection. Then we complete your quote and set timeframes. Once you’ve accepted the quote and we process your deposit, we’ll set a start date. When we begin working in your home, we understand that it can be inconvenient. We use drop sheets everywhere possible and finish each day by vacuuming and cleaning. Treating your home like our own is a priority for us and our entire team is respectful of your privacy. In order to ensure your safety, we use new shut-offs, ABS traps, GFI receptacles and braided hoses throughout our time in your home. All our workmanship and products are covered by warranty and we carry $2,000,000 worth of liability insurance in addition to the full workman’s compensation for your personal protection. Further, you’ll only have Aqua-Tech staff members in your home as we never contract out and all electrical work is done by our licensed electrician. Our work in your home is not complete until you’re fully satisfied with our work and in love with your new bathroom. To that end, we always conduct a follow up visit to ensure you’re comfortable with any custom functionality and to guarantee that everything’s working as it should. Ready to begin? Call today for your tour of the show room or to request your quote. Book A Renovation Consultation With Our Expert Bath Design Consultant! Request a consultation with Aqua-Tech's Bath Design Consultant today to discover how easy it can be to transform your bathroom into the most beautiful part of your home.